So this decidedly creepy book made me glad that I didn’t go through a real estate agent to buy my house, and made me want to change all the locks in my house. While Hogan did an excellent job weaving a narrative that was disturbingly believable, I found the ending to be extremely disappointing, which dropping my rating to a high 3/5. While it isn’t a book I want to read again, I can’t deny that I had trouble putting it down. If the conclusion had been more to my taste, this book probably would have been an easy 4/5. Our narrator is Mr. Heming. A middle-aged real estate agent in a smallish town, Mr. Heming seems like a pretty uninteresting and unmemorable individual to everyone he meets. But as the story unwinds, we find out more and more about Mr. Heming – his childhood, his current activities, his thought processes – and things get quite creepy fast. Mr. Heming is 100% unlikable. He is arrogant and psychotic and disturbing. He views himself more or less as a god, as someone to whom the gifts of justice and retribution have been given. The front jacket will tell you that Mr. Heming has kept a copy of every key for every house he has sold, and he uses them frequently. The idea of someone being in your house when you’re gone (or when you’re there!) is just so eerie, and Hogan plays it out perfectly. As the front door opened, I left noiselessly from the conservatory at the rear … I am generally scrupulous in making a clean exit, though on this occasion it pleased me to think of Mrs Houth halting in her steps while her husband struggled with the suitcases. ‘That’s odd,’ I imagined her saying. ‘Can you smell coffee?’ A small aromatic mystery getting smaller with each sniff of the air. The book switches back and forth between present day and Mr. Heming’s recollections of childhood. His childhood memories are also disturbing, and his whole character becomes more and more frightening the more you learn about him. It was funny, because I had just finished reading The Blackhouse, which, in some ways, followed a similar pattern of switching between past/childhood and present day. But where The Blackhouse followed a logical structure, A Pleasure and a Calling sort of drifted along, snagging random thoughts and memories. In a weird way, this actually worked. The Blackhouse was told from the perspective/about a logical, straightforward individual, while A Pleasure and a Calling is told from the perspective a man who is, frankly, insane. Thus, the rather disorienting order of events actually worked for this narrative. Our story mainly follows Mr. Heming’s obsession with a young woman. She is having an affair with a guy who is pretty sleezy. Mr. Heming attempts to protect her through various methods, even though she doesn’t even know he exists. 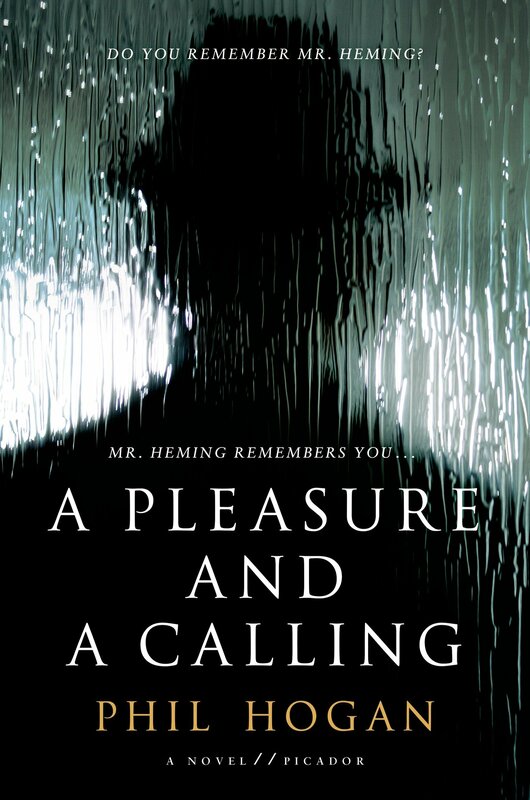 In the meantime, we learn more about how Mr. Heming got to where he is/became who he is through flashbacks. This book kind of reminded me of a Hitchcock film. Hitchcock once said that one of his tricks to was to have the camera tilted very slightly. The angle was so minimal that the viewers minds didn’t consciously recognize it as such, but it was enough to make them feel that something was off – just enough to make them feel uneasy, adding to the overall feeling of tension Hitchcock was striving for. Hogan did the same thing in his book. Mr. Heming presents all of his own actions in a matter-of-fact tone, as though what he has done is the only thing any person would have done in the same situation. He is supremely confident that what he has done is right and good, and that leaves the reader feeling disoriented, because that isn’t really what a normal person would do… is it?? This book was first brought to my attention by some book newsletter or other, and then its position on the TBR was confirmed by the review over at Reading, Writing & Riesling. So the main thrust of this story is that Mr. Heming becomes obsessed with this certain young woman who is having an affair, right? And eventually, series of events, Mr. Heming kills her lover. However, this is not his first murder – as he tells various stories from his youth and past, we find him to be violent and unstable, and in fact, a killer several times over. What I like in my fiction is for, in the end, the killer to be brought to justice. So I more or less assumed that Mr. Heming is telling this story from, I don’t know, prison. But no! We get to the end of the story only to find that he’s gotten off completely free! Though the police were somewhat suspicious at times, apparently they moved on, and he’s going right along living his life like always. I assume that Hogan wanted us to feel uneasy still, knowing that people like Mr. Heming live among us, but it just made me annoyed. I mean, seriously? I’ve spent an entire book listening to this guy brag about how awesome he is and how no one ever catches him – and it’s true?! His whole superior god-like attitude grated on my nerves throughout, and then I didn’t even have the satisfaction of seeing him get his own. Instead, Mr. Heming says “I told you so” and rides off into the sunset, scot-free. Unbelievable. Overall, A Pleasure and a Calling, was a book that really engaged me, but the ending so frustrated me that I left it at a 3/5. Still a solid once-read, but not one that will become a classic for me. This entry was posted in Book Review, Fiction, Thriller and tagged 3, A Pleasure and a Calling, Phil Hogan, thriller. Bookmark the permalink. I like your Hitchcock reference, it is so accurate- that feeling of something not quite right.